It’s October again and that means we are honoring Breast Cancer Awareness Month. We are so thankful to have worked with several resilient women this year as part of their post rehab process. It's exciting to know that breast cancer mortality rates have decline 39 percent because of fundraising and research, and now is no time to stop. We wanted to take a moment to share with you the stories and information we gathered for last year's October blog because it's still so relevant a year later. Each year it’s amazing the new and creative ways organizations are sparking awareness and inspiring fundraising for breast cancer. At the same time, many women reflect on their own diagnosis and others breathe a tentative sigh of relief while on a path to remission. Additionally, most of us pause to reflect on and honor someone we knew and lost to breast cancer. According to the National Cancer Institute 1 in 8 women will be diagnosed with breast cancer in America their lifetime. The treatment process can be a year or more and there are numerous follow-up visits. As early detection and treatment strategies continue to improve of the 12% of women diagnosed 9.3% will survive the diagnosis based on statistics from the American Cancer Society. That means there are 3.1 million women motivated to live life to the fullest after a serious health scare like breast cancer. 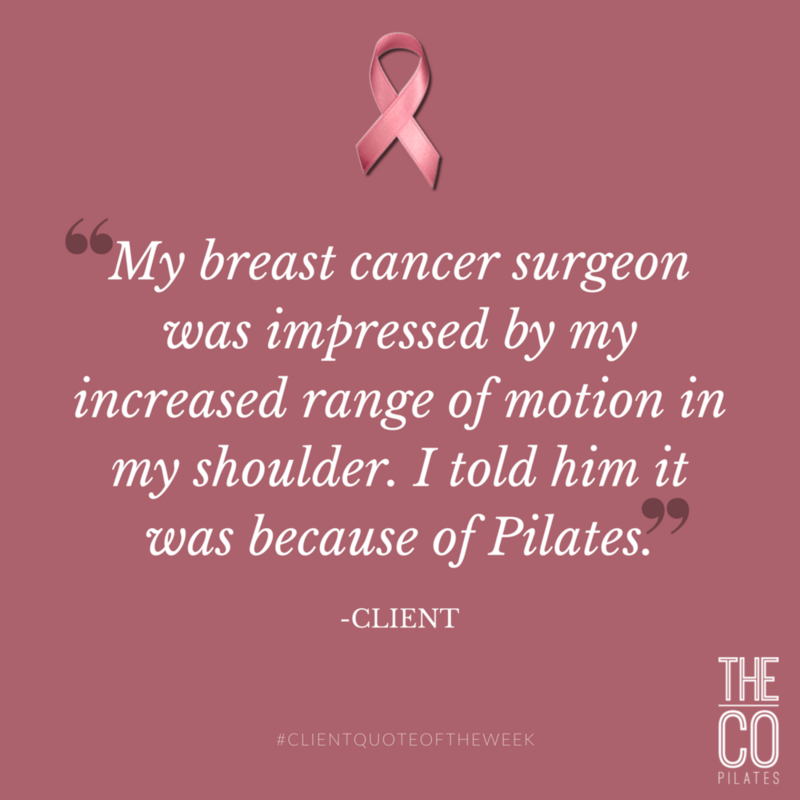 Joan B, a client of The Co Pilates, shared her 15 year experience with breast cancer. Joan was on Hormone Replacement Therapy (HRT) which used estrogen to treat early menopause. A routine mammogram revealed that she had precancerous cells and subsequently underwent a lumpectomy to remove the tissue. As a precautionary measure she was taken off of HRT and placed on Tamoxifen, a preventative cancer drug that inhibits estrogen. During that transition in treatment Joan recalls dramatic changes in her body chemistry, like a race car slamming on the brakes and spinning 180 degrees. Noticeable periods of intense exhaustion were especially troubling to Joan because she was already leading a healthy and active lifestyle. One year later a follow-up mammogram unveiled more precancerous cells and Joan underwent a second lumpectomy. For the next five years she remained on Tamoxifen to assist with defending against further cancerous cells. While the extreme shift in medication slowed her down neither lumpectomy inhibited her physically. Approximately 10 years later in 2015 a sonogram, known to offer better diagnostic capability, uncovered a diagnosis of Stage 1 infiltrating carcinoma. As a result Joan underwent her third lumpectomy, the removal of 4-6 lymph nodes, a series of 34 radiation treatments, and was placed on Letrozole, another preventative cancer drug. Despite periods of fatigue that resigned her to slow down yet again, Joan stayed active with routine walks and daily activity throughout the experience. Due to the residual side effects from Letrozole, including aches and joint stiffness, Dr. Bleyer recommended physical therapy. Joan then advanced to a Pilates program for continued activity and progress. In reflection, Joan felt that a “more full blown exercise routine would have helped balance the periods of major fatigue.” This is especially true when she considers the benefits of improving cardiovascular capacity and and the calmness she experiences through mindful breathing - a skill she has gained through her Pilates program. With the help of a weekly Pilates regimen Joan has noticed an improved range of motion, increased muscular strength, and very positive evaluations from her breast surgeon. As women we have powerful bodies capable of so much. Breast cancer, no matter your level of diagnosis or complexity of treatment, can severely interrupt our connection to that powerful identity. Movement and staying fit in a mindfully is a natural and timeless way of reclaiming that identity. We at the The Co Pilates always feel privileged when our clients allow us to facilitate in that process. Our bodies are what move us through this life and if we aren’t moving, and truly present in that movement, we aren’t truly living. If you have a story of how movement and exercise supported you or a loved one through breast cancer treatment we would love to hear about it. It’s October and there’s pink everywhere! Each year it’s amazing the new and creative ways organizations are sparking awareness and inspiring fundraising for breast cancer. At the same time, many women reflect on their own diagnosis and others breathe a tentative sigh of relief while on a path to remission. Additionally, most of us pause to reflect on and honor someone we knew and lost to breast cancer. According to the National Cancer Institute 1 in 8 women will be diagnosed with breast cancer in America their lifetime. The treatment process can be a year or more and there are numerous follow-up visits. As early detection and treatment strategies continue to improve of the 12% of women diagnosed 9.3% will survive the diagnosis based on statistics from the American Cancer Society. That means there are 3.1 million women motivated to live life to the fullest after a serious health scare like breast cancer.